I bring people to listen to the RM/2s and they are mesmerized. I am sure i am nowhere near linear response, but my VMPS now sound better than anything I've heard before them. Yes, the whole line of VMPS speakers are bargains in their price range, among the most natural-sounding speakers made. I used a 1991 manufactured pair of Vandersteen 2Ci for 20 years, longer than any audio product I ever owned. 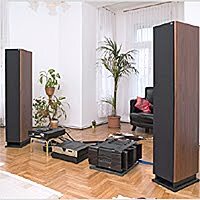 They were replaced by a similar size and weight VMPS RM1 recently, manufactured around 2001, using a push-pull ribbon midrange and spiral ribbon tweeter. Delapidated woofer surrounds were replaced, and internal stuffing was changed to Acousta-Stuf, and passive radiator had a couple of mods. The new midrange CDWG is on order. They surpass the Vandersteen 2Ci in just about every parameter. I heard that Brian Cheney was going to reintroduce the RM1. It filled a void that the current lineup of VMPS products now has. 626R is too small for deep bass, and the RM2 is too big for some people, RM30 too expensive for me, but I find the RM1 just right for my smallish 8x11x19 listening room and musical tastes, and I have a -6dB point of 25Hz, only about 3db less output than the huge RM40 speakers. The whole line of VMPS products were really quite wonderful, and I would recommend them to anyone. I'm just sorry that since the owner/designer's death, the company is no longer making the speakers (although parts and a few select models are still available, I understand).